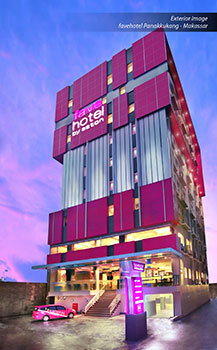 Jakarta, February 11th 2015 – Following last year’s opening of the favehotel Daeng Tompo - Makassar, Archipelago International continues to expand its cheerful chain of 2 star favehotels in Makassar with the opening of the favehotel Panakkukang. The hotel offers 110 functional, select service hotel rooms, focusing on facilities that are truly important to most travellers. Guests can look forward to free and reliable high-speed WiFi throughout the entire hotel, favehotel’s typical edgy design, uncompromising standards for cleanliness and comfortable beddings with top notch pillows and 100% cotton linens. “Makassar has become one of Southeast Asia's most prominent cities and the dominant trading centre of Eastern Indonesia. With its multicultural and multi-religious atmosphere, tolerant attitudes and 'open-for-all' approach to business and trade, Makassar remains a major crossroads for shipping and trade, and is perfect destination for a super clean, modern, fun and inexpensive hotels like fave” said John Flood, President & CEO of Archipelago International.